Started with an XACT - oldest still running is a Streamer - keep a collection of spares - terrestrial here is terrible. MadisonRadio1, microbob and HecticArt like this. Welcome to the DRC IH. My wife has an Airware somewhere which is active (lifetime) but she never listens to it. She is near 100% online or in the car. I have an SL2 still active which I record AT40 and 80s countdowns and listen later. Have a functional Tao radio which my son used to use but I deactivated it some time ago. 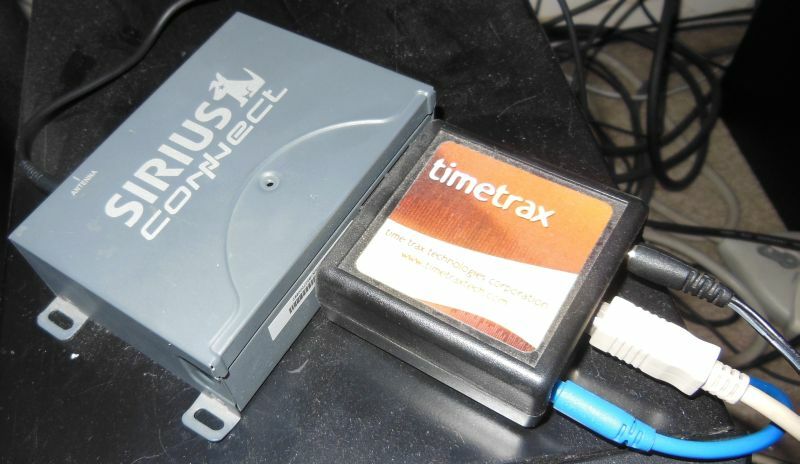 I'm still running my original TimeTrax TTS-100 from 2005. It has a lifetime sub and has been in daily use for 10 years (and counting). JHDK, IndustrialH, microbob and 2 others like this. Nice! Where's the flux capacitor? Welcome to the DRC dvarapala. In ignorance I had to run to Wikipedia to inform myself about TimeTrax - brilliant idea - no doubt hammered to death by the RIAA - I hope it keeps on keeping on for another ten plus years. TimeTrax had a brief but bizarre history. It started out as an application for the XMPCR that would capture and save the audio coming out of the radio into individual .MP3 files. This app was very controversial at the time because it allowed people to effortlessly build up massive .MP3 collections at virtually no cost (and without paying royalties to the recording industry). The guy that wrote the app sold out to a larger company which soon produced a Sirius version (which I own). Apparently a software engineer named Jeremy Profitt, who helped TimeTrax reverse-engineer the protocol used by Sirius Connect radios, started a competing product called "Give Me Satellite Radio!" TimeTrax quickly put the kaibash on it, claiming ownership of all of Jeremy's satellite radio work; Jeremy subsequently disappeared from the satellite radio scene. Then TimeTrax itself disappeared about a year after that, for reasons that were never publicly disclosed. For a time the timetraxtech.com domain pointed to the XM web site, leading to speculation that XM and/or the RIAA had forced TimeTrax to shut down. Whatever the cause of TimeTrax's sudden demise, the irony is pretty huge. Anyway, the TimeTrax software ("Recast") was pretty crappy. It never worked correctly, failing to even recognize my radio. Even if it had worked, the software would constantly "phone home" to the TimeTrax servers during operation; if the software could not contact the servers it would refuse to run. After TimeTrax went out of business the registration servers eventually went away, leaving their users high and dry. Fortunately there are alternatives to the TimeTrax software, and the hardware is still working 10 years later. My wife just called to tell me that our Starmate 2, which we first activated in '05 - and they never shut it off - just got turned off. She's been using it in her home office for years. Bummer. Sounds like you had a long run before they dinged it. Ahh the starmate replay was my first baby. The free preview ended a few days ago. That might have dinged it. My original radio was a Sportster Replay with the good FM signal. Other than having to keep the brightness as low as possible and keep it popped out of the boombox, I loved that thing. Honestly, the worst I owned was the SL2 or one of the "buy a subscription, get a non-replay radio for $10" radios. Those SL2s were a work! The dials would always stop spinning, the only way to get satellite signal in my area was via a dock or the headphones, the whole debacle with the channel logos, etc. With that said, I still have my Sportster Boombox and my SL100 car dock that I sawed the sides off of to accommodate the SL2. My SL2 is hanging on and my wife has an Airware somewhere although she listens exclusively online or in the car now. I still have my SL2. It's working fine. I wanted to keep it for a while as a backup when I got my Lynx, but I keep forgetting to sell it. Haha, yes keeping the brightness level low on the starmate replay was a must. 12-12-05 was the day I purchased it from radio shack. 10 years! Dig! How did you score that? It ain't active but there is a Jensen SSR2000 sitting in my Sirius goodies storage box - tempted to kick it on - but it doesn't seem to see 167 - which is a bit of a necessity (for the live CFL games). I offered it to my son for his truck, but the truck had a total meltdown. Maybe you can have some fun with the secret codes. I have a Sportster Replay I bought used from DAB back in 2005. I put a lifetime subscription on it, but I haven't used it in years. Five or more years. It has a very washed out screen. Very hard to see in the daytime. I need to find it & hook it up & see if it still works.